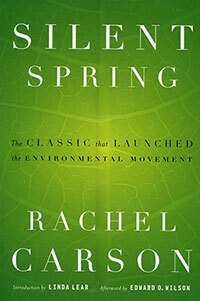 Rachel Carson's Silent Spring was first published in three serialized excerpts in the New Yorker in June of 1962. The book appeared in September of that year and the outcry that followed its publication forced the banning of DDT and spurred revolutionary changes in the laws affecting our air, land, and water. Carson's passionate concern for the future of our planet reverberated powerfully throughout the world, and her eloquent book was instrumental in launching the environmental movement. It is without question one of the landmark books of the twentieth century. This year, 2012, is the 50th anniversary of the publication of the book by the Pittsburgh born Carson. This was the second year of a school bulletin board. 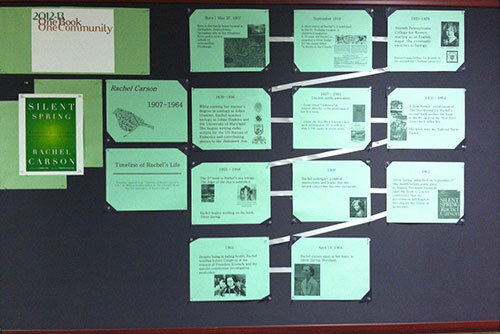 The photo to the right is of the first display, a timeline of Rachel Carson's life. Displays changed every six weeks throughout the academic year. Launched on the 50th anniversary of Silent Spring's publication, the One Book, One Community Facebook page promotes interactive news feeds, tools, discussions, and more. Like it today! The 2012-13 One Book, One Community Main Event was held on March 18, 2013. The event included a viewing of the movie, A Sense of Wonder and panel discussion of Pitt Public Health faculty, Drs. Bernard Goldstein, Candace Kammerer, and Jeremy Martinson. Unfortunately our scheduled guest Dr. Leonard Krishtalka, professor of ecology and evolutionary biology, University of Kansas was unable to join us. A reception followed the event where the conversation continued. March 2013 | "From the Sea to Silent Spring" by Fredrick R. Davis, Science. September 27 | "Rachel Carson's Book Turned the Environmental World on it's Ear 50 Years Ago" by Don Hopey, Pittsburgh Post-Gazette. September 21 | "How 'Silent Spring' Ignited the Environmental Movement" by Eliza Griswold, The New York Times. September 20 | "Silent Spring to get big screen adaptation"Variety Film News. September 9 | "Rachel Carson, killer of Africans?" by William Souder, Pittsburgh Post-Gazette. September 3 | "Rachel Carson's Prescience" by Rob Nixon, The Chronicle of Higher Education. In our backyard, the Rachel Carson homestead located in Springdale, just 18 miles away. If you have any questions, contact Robin Leaf, educational programs coordinator, 412-648-5984.